When the weather forecast predicts frosty mornings are on the cards, get out there and photograph it. With a cool, clear night comes morning frost and it's a subject that works well for both close-up work and wider landscape shots. For your close-ups of the patterns frost creates you'll need a macro lens or a 70-200mm zoom lens with extension rings will work just as well if you don't own a macro lens. A tripod's handy for the times you'll be working in shaded areas and a lens hood attached to your lens will help prevent flare when shooting in the direction of the sun. Take a reflector out with you (a piece of card covered in foil will do fine) as they're useful for bouncing light into shaded spots and remember to slip a few spare batteries into your pockets if you're planning on venturing out for a while. It's also worth remembering to wrap up warm as you'll soon feel the cold when you're stood waiting for those longer exposure times to complete. If the weatherman tells you it's going to be a cloudless night set the alarm clock to go off early, before the sun rises is a good time, as the lack of cloud cover means there's nothing to keep heat in so there's more chance of frost appearing. Head for open spaces (fields) rather than places that are sheltered (forests) as the canopy, or whatever is creating the shelter, can prevent frost from forming. Like snow, frost, particularly when it's a thick covering, can fool your camera's meter to think the scene's much lighter than it actually is and it will underexpose the shot. If this happens, use exposure compensation and shoot half to one and a half stops over what your camera thinks is correct. You should always check your histogram to ensure the exposure's correct. Side and direct light will help emphasise the way the frost glistens and side light in particular can help add depth to your scene. Try shooting directly into the sun so the frost glistens, you just need to use a lens hood to minimise the chances of flare spoiling your shot. Frost will last longer in shaded areas, but you'll need to use a reflector to bounce much-needed light into the shot. This will add the sparkle you expect to see when you look at frost and help remove the blue cast that's common with shade. For shots that capture the patterns and textures frost creates, get in close and avoid using flash. Adjusting your white balance to create a cooler colour temperature can further enhance the feeling of cold in your shot. You can also adjust the contrast of the image during post-production to give more definition to the patterns the frost has created. Once home, don't take your camera out of your bag as soon as you get through the door as condensation can form on your camera / lens. Instead, leave it in your bag while it acclimatises. If you don't want to venture too far have look for frost on your windows as the patterns it produces are great for macro work. Out in the garden, icy blades of grass are worth capturing early in the morning and look for fallen leaves that are covered with frost while you're out there too. Use a small aperture to make sure more of your image is sharp but if you're working with a leaf that's still on a tree, try using a wider aperture to throw the background out of focus, isolating the leaf in the process. While you're looking at branches look for frost covered berries as the reds contrast well with the white coloured frost. 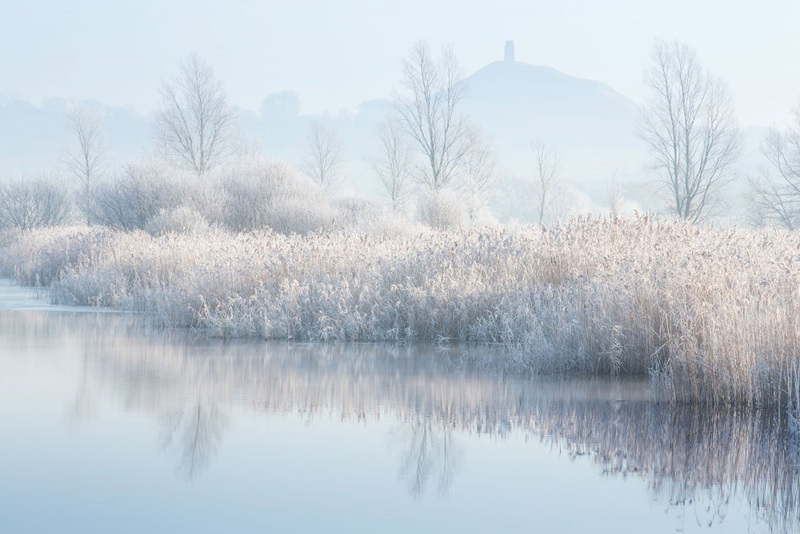 Around ponds, reservoirs, rivers and lakes, look for frosted up reeds and branches above and around the water. They make interesting close up studies but do take your wider lens with you too to capture a frosted landscape. Finally, don't forget about capturing the popular frosted spiders web. Look for webs on or facing hedges, fences and other plain, dark backgrounds as this will help the web stand out. Use a large aperture too so the darker backgrounds also thrown out of focus. If you find using auto focus doesn't give you sharp enough images, switch to manual as if the focus isn't right, your shot will lose impact and can be spoilt. Great tips for those frosty mornings that are due. Inspirational ideas to get me up in the early hours. Thanks. Great tips for those frosty mornings that are due. Inspirational ideas to get me up in the early hours. "Once home, don't take your camera out of your bag as soon as you get through the door as condensation can form on your camera / lens. Instead, leave it in your bag while it acclimatizes." A very valuable tip I follow from my film days. Now I take out the memory card and leave the camera inside the bag to come up to room temperature slowly. Usually overnight. "Once home, don't take your camera out of your bag as soon as you get through the door as condensation can form on your camera / lens. Instead, leave it in your bag while it acclimatizes." A very valuable tip I follow from my film days. Now I take out the memory card and leave the camera inside the bag to come up to room temperature slowly. Usually overnight.